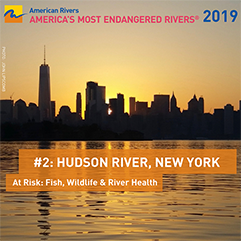 Record heavy rains fell on June 26, 27 and 28 during our June patrol to Troy causing massive erosion in the watersheds of several Hudson River tributaries. 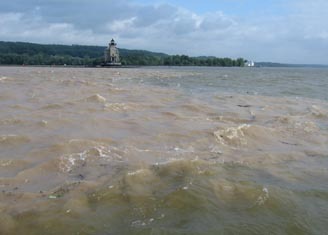 In one photo you see the brown flood blowing out into the Hudson at the Kingston Lighthouse on Rondout Creek. 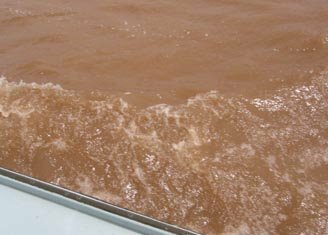 The other shows the Hudson tinted red/orange from sediment flushing out of Esopus Creek at Saugreties. The flood also carried out a tremendous load of plastic trash which will litter the shoreline for years to come. It was interesting to see that tributaries flowing through undisturbed countryside still ran clear in spite of the deluge – with no sediment load from erosion. Most erosion is due to overdevelopment, road construction and impervious surfaces – sprawl.